The Great Eastern Supremacy Scholarship Award is one of the leading programmes in the insurance industry. Every year since 1998, we have been the platform where almost a hundred deserving, talented, young Malaysians can pursue their dreams. To date, Great Eastern Life has awarded over RM12 million to 180 recipients who dared to dream, to be different, and took the lead in realising those dreams. Here, we do not just provide great career opportunities for people; we also nurture, care and develop them from young – even before they begin their journey towards success. How To Apply Great Eastern Scholarships? To submit an application*, please fill in the application form. All applications MUST reach by 31 March 2019. Please refer to the list of universities which we can offer the Great Eastern Supremacy Scholarships for studies as indicated in the sponsored courses above. ONLY successful applicants will be notified via email and / or telephone. YSD supports well-rounded students with outstanding academic achievements, active involvement in extracurricular activities and participation in community service. This scholarship applies to those who wish to pursue full-time studies at Pre-University and Undergraduate levels in prominent universities locally and overseas. Yayasan Sime Darby invites qualified SPM 2018 leavers to apply for education sponsorship to pursue foundation studies in China. YSD are looking for well-rounded Malaysian candidates who have attained excellent academic achievement, demonstrated outstanding leadership qualities and potential, as well as those who devoted time to make an impact to the community through their extra-curricular activities. Strong leadership qualities through various leadership positions held in school and societies. Note: Scholarships for courses other than those mentioned above are not available. The full scholarship includes tuition fees, board and lodging, a computer allowance, shipping allowance, and flight tickets for the beginning and end of studies. Recipients of the scholarship will have the opportunity to undergo a Scholars Development Programme and experience work exposure through internships at Sime Darby Companies i.e. Sime Darby Plantation Berhad, Sime Darby Property Berhad and Sime Darby Berhad. Note: A students' admission to the assigned preparatory college will be arranged by YSD. On completion of foundation and undergraduate studies in China, scholars will be required to serve Sime Darby Companies for 5 to 6 years, depending on the value of the scholarships. Applications open on 1 March 2019 and close on 31 March 2019. Click here to apply. Yayasan Sime Darby invites qualified SPM 2018 leavers to apply for education sponsorship to pursue foundation studies locally, leading to undergraduate studies in the United Kingdom. We are looking for well-rounded Malaysian candidates who have attained excellent academic achievement, demonstrated outstanding leadership qualities and potential, as well as those who devoted time to make an impact to the community through their extra-curricular activities. On completion of foundation and undergraduate studies in the United Kingdom, scholars will be required to serve Sime Darby Companies for 5 to 6 years, depending on the value of the scholarships. Yayasan Sime Darby invites qualified Sijil Tinggi Pelajaran Malaysia (STPM) or diploma holders from recognised academic institutions to apply for education sponsorships to pursue undergraduate studies at recognised Indonesian universities approved by YSD. We are looking for well-rounded Malaysian candidates who have attained excellent academic achievements, demonstrated outstanding leadership qualities as well as devoted time to make an impact to the community through their extra-curricular activities. Recipients of scholarships will have the opportunity to undergo a Scholars Development Programme and experience work exposure through internships at Sime Darby Companies i.e. Sime Darby Plantation Berhad, Sime Darby Property Berhad and Sime Darby Berhad. On completion of studies, scholars will be required to serve Sime Darby Companies for 5 to 6 years, depending on the value of the scholarships. Yayasan Sime Darby invites qualified students who will commence their undergraduate programme in September 2019 after completing their STPM or Foundation/Matriculation studies as well as those who are in their first year of undergraduate studies to apply for education sponsorships to pursue undergraduate studies at recognised Malaysian academic institutions approved by YSD. We are looking for well-rounded Malaysian candidates who have attained excellent academic achievement, demonstrated outstanding leadership qualities and potential and devoted time to make an impact to communities through their extra-curricular activities. The full scholarship covers tuition fees, a living allowance, books allowance and computer allowance. On completion of studies, scholars will be required to serve Sime Darby Companies for 2 to 6 years, depending on the value of the scholarships. At Yayasan TM (YTM), we are passionately driving the national agenda of developing future leaders of tomorrow who are able to empower the digital economy, in line with TM's role as an enabler of Malaysia's Digital Nation aspirations. We are inviting talented young Malaysians to be part of this Digital journey through our scholarship programme: FUTURE LEADERS SCHOLARSHIP. This scholarship is open to SPM 2018 & STPM 2018 students who are pursuing foundation and/or first degree. The scholarship package covers tuition fees, books and apparatus, stipend, computer allowance, and practical allowance. 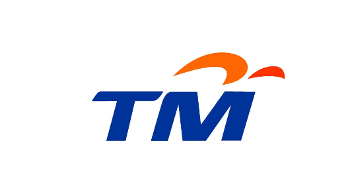 How to Apply TM Scholarship? Complete and submit online application form. Yayasan Bank Rakyat has released a premium education scholarship scheme for Bachelor's degree students currently in their first semester. Priority is given to the following fields of study: Banking & Business. The sponsorship includes tuition fees and subsistence. Online application only. Terbuka kepada Warganegara Malaysia sahaja. Minimum 8A bagi lepasan SPM dan minimum CGPA 3.50 bagi lepasan matrikulasi / asasi / diploma. Berumur 18 tahun ke atas dan tamat pengajian sebelum berumur 30 tahun. Peringkat pengajian Ijazah Sarjana Muda. Mod pengajian adalah sepenuh masa. Terbuka kepada pelajar semester satu sahaja. Tempoh pengajian maksimum adalah 4 tahun. Bidang pengajian adalah diutamakan kepada bidang Perbankan dan Perniagaan. Jumlah tajaan merangkumi yuran pengajian dan sara diri. Minimum 8A for SPM or minimum CGPA 3.50 for Matriculation/Foundation/Diploma. 18 years or above, and graduate from the programme before the age of 30 years. Open to Bachelor's degree students only. The mode of study is full time. Open to first semester students only. The maximum duration of study is 4 years. All colleges, universities and courses have different entry qualifications. 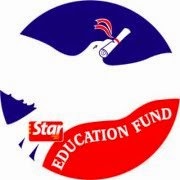 Applicants can visit the Sin Chew Daily Education Fund ( http://www.sinchew.com.my/scedufund ) or directly to the relevant colleges and universities. The Shell Malaysia Scholarship Programme application opens annually from 25th of February to 30th of March 2019. Since its inception, the Shell Malaysia Scholarship Programme has benefitted more than 1500 students in pursuing their educational aspirations and provided a unique entrance into the energy industry. Application form will only open on 12am (GMT+8) on 25th February 2019. A scholarship with Shell Malaysia opens a world of possibilities including opportunity to pursue undergraduate studies in global top tier universities, participating in mentoring, internship programs, and upon graduation, embarking on a fulfilling career with us. Apply now and be part of the Shell story! The offering is for candidates to be sponsored 2 tiers A-levels and undergraduates in prestigious colleges and universities locally and overseas. This is subject to the scholastic performance of the student. Prior to application, ensure you are eligible to work in the country where the scholarship program is offered. Candidates needs to complete the Step 2: Online Assessment within 10 days of receiving them via email. Only shortlisted applicants will be notified to progress to the next steps of application. Complete your application online – note you can save time by connecting to your LinkedIn profile. Before applying, make sure you are eligible to work in Malaysia. The application shouldn’t take more than 5-10 minutes. After you’ve submitted your application, you’ll be asked to complete three online assessments. Altogether, this will take about 40 minutes and will need to be completed within 10 days of receiving them. For Practice Test, please refer to Cubiks Cognitive Assessment. For Practice Test, please refer to Cubiks Working-Styles Assessment. If you have been shortlisted after STEP 2, you’ll be sent an invite to complete an on-demand video interview. This short, self-recorded video interview is an opportunity for you to tell us about yourself and your qualifications. You’ll also see some of our current graduates who will ask you a series of pre-recorded competency-based questions. You may record the interview at any internet-enabled location at a time most convenient to you. For each question, you’ll have 30 seconds to prepare and 3 minutes to record your answer. This is the last assessment stage, where you will be interviewed by the Scholarship Board of Trustees on scenario based questions and your academic & leadership experiences. Level 12, Leboh Pasar Besar, P.O Box 10815, 50726 Kuala Lumpur, Malaysia. *Kindly write SAP2019 at the top right corner of the letter. Cambridge A-Level, American Degree Foundation Program and South Australian Matriculation. Kijang Scholarship is awarded to eligible individuals to pursue pre-university and subsequently undergraduate studies in Economics, Accounting, Finance, Actuarial Science, Mathematics, Statistics, Data Science, Law and Computer Science at top universities per the Bank's list of approved universities. The sponsorship to pursue bachelor's degree is subject to the scholar meeting the Bank's approved criteria. 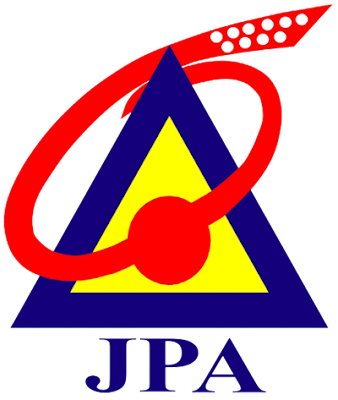 Pinjaman MARA Program YTP 2019 untuk Lepasan SPM 2018 – Tawaran Pinjaman MARA Permohonan Program Young Talent Development Programme (YTP) untuk Lepasan SPM 2018 kini dibuka. Pemohon dinasihatkan untuk menyemak syarat kelayakan terlebih dahulu sebelum membuat permohonan. Hanya pemohon yang memenuhi syarat kelayakan sahaja akan dipertimbangkan untuk ditawarkan dalam Program YTP. Pemohon DAN salah seorang ibu ATAU bapa berstatus Bumiputera dan Warganegara Malaysia. Ibu, bapa, penjaga, penjamin serta pelajar TIDAK DISENARAI HITAM atau sedang dalam tindakan undang-undang MARA. Pemohon tidak menerima bantuan kewangan dan tajaan dari mana-mana badan penaja atau agensi untuk pengajian pada peringkat yang sama. Keutamaan diberi kepada Pelajar Cemerlang dari golongan keluarga yang berpendapatan rendah (B40). Menduduki peperiksaan Sijil Pelajaran Malaysia (SPM) buat kali pertama pada tahun 2018. Memenuhi SYARAT KELAYAKAN PROGRAM seperti yang diiklankan. Tajaan pinjaman pelajaran di peringkat persediaan merangkumi Yuran Pengajian, Elaun Sara Hidup serta Elaun Pengangkutan. Elaun Pengangkutan (pergi & balik) hanya akan dibayar kepada pelajar Semenanjung yang mendapat tawaran pengajian di Sabah / Sarawak atau pelajar Sabah / Sarawak yang mendapat tawaran pengajian di Semenanjung. Permohonan boleh dibuat secara atas talian (online) melalui laman web rasmi MARA http://www.mara.gov.my apabila permohonan dibuka. Pemohon hendaklah mendaftar terlebih dahulu sebagai pengguna baharu sebelum mengisi permohonan. Pemohon perlu mencetak slip pengesahan permohonan setelah selesai membuat permohonan untuk tujuan rujukan. Pemohon juga dinasihatkan membaca dan memahami garis panduan yang disediakan sebelum membuat permohonan. Pelajar akan mengikuti Program Certified Accounting Technician (CAT) selama satu (1) tahun hingga satu (1) tahun enam (6) bulan di Kolej Profesional MARA Ayer Molek (KPMAM) dan pelajar berpeluang menyambung pengajian ke Peringkat Professional Association of Chartered Certified Accountants (ACCA) di Kolej Universiti Poly-Tech MARA Kuala Lumpur (KUPTMKL). Pelajar akan mengikuti Program Certificate in Finance, Accounting and Business (ICAEW-CFAB) selama satu (1) tahun enam (6) bulan di Kolej Profesional MARA Beranang (KPM Beranang) dan pelajar berpeluang menyambung pengajian ke Peringkat Professional ICAEW di Universiti terkemuka di dalam negara. 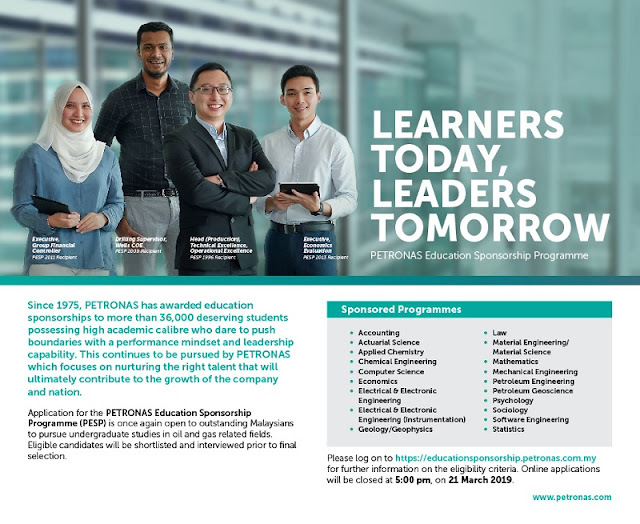 Since 1975, PETRONAS has awarded education sponsorships to more than 36,000 deserving students possessing high academic calibre who dare to push boundaries with a performance mindset and leadership capabilities. This continues to be pursued by PETRONAS which focuses on nurturing the right talent that will ultimately contribute to the growth of the company and the nation. Application for the Petronas Education Sponsorship Programme (PESP) is once again open to outstanding Malaysians to pursue undergraduate studies in oil and gas related fields. Eligible candidates will be shortlisted and interviewed prior to final selection. Universiti Teknologi PETRONAS including 1-year Foundation Programme. Overseas Universities including up to 24 months at Pre-University Programme in Malaysia. How to Apply Petronas Scholarship / Cara Permohonan Biasiswa Petronas? All applications must be submitted via online application system at https://educationsponsorship.petronas.com.my. NO processing fee is required for PESP application. Notification of successful candidates for the PYD will be announced via https://educationsponsorship.petronas.com.my. The same username and password will be required for log-in purposes. Incomplete or late application will not be processed. Applications open from 14th March 2019 and closes on 21st March 2019 (5.00 pm). Click Guideline for PESP Applicants 2019 and FAQ for your reference. Permohonan online bagi Program Penajaan Nasional Tahun 2019 mula dibuka pada 15 Mac 2019 (Jumaat) jam 5.00 petang sehingga 21 Mac 2019 jam 5.00 petang. Program Penajaan Nasional (PPN) tahun 2019 merupakan penajaan kepada 20 orang pelajar paling cemerlang lepasan Sijil Pelajaran Malaysia (SPM) tahun 2018 untuk melanjutkan pelajaran ke universiti terkemuka dunia. Calon-calon yang terpilih akan ditawarkan penajaan secara pinjaman boleh ubah (PBU) bagi mengikuti pengajian peringkat persediaan sehingga ke peringkat ijazah pertama tertakluk kepada syarat- syarat yang ditetapkan dan pengiktirafan bidang pilihan di Universiti terbaik dunia di USA dan di UK seperti yang disenaraikan dalam QS World University Rankings dan / atau THE World University Rankings. Pelajar-pelajar akan mengikuti kursus persediaan di Kolej Yayasan UEM (KYUEM). Pelajar-pelajar akan ditaja untuk mengikuti pengajian peringkat Ijazah Pertama di Universiti terbaik dunia di USA dan di UK seperti yang disenaraikan dalam QS World University Rankings dan / atau THE World University Rankings. Senarai bidang dan universiti adalah seperti di LAMPIRAN A.
Sekiranya pelajar menamatkan kursus persediaan dan melepasi cut-off point (COP) yang ditetapkan untuk melanjutkan pengajian ke peringkat ijazah pertama namun tidak mendapat tempat di 10 universiti terbaik dunia di US dan 10 universiti terbaik dunia di UK seperti yang disenaraikan di LAMPIRAN A (QS World University Rankings dan / atau THE World University Rankings), pelajar akan ditamatkan dari program PPN dan diserap masuk ke program dalam negara. Pelajar hanya ditaja untuk mengikuti pengajian di universiti di dalam negara tertakluk kepada pelajar mendapat tempat pengajian di institusi pengajian dalam negara yang ditetapkan Kerajaan dan melepasi syarat-syarat akademik. Tidak menerima bantuan kewangan / tajaan dari mana-mana agensi untuk peringkat atau pengajian yang sama. Umur belum mencapai 18 tahun (19 tahun bagi pelajar peralihan) pada 31 Disember tahun peperiksaan SPM diduduki. Dua (2) mata pelajaran lain. Pelajar-pelajar yang ditawarkan penajaan di bawah program ini akan mengikuti kursus persediaan di Kolej Yayasan UEM (KYUEM) selama 24 bulan. Selain daripada keadaan seperti di atas, pelajar dikehendaki membayar balik sepenuhnya nilai pinjaman. Pelajar yang berminat perlu mengisi profiling secara atas talian (online) di http://esilav2.jpa.gov.my yang dibuka khusus kepada calon terlibat sahaja. Calon dibenarkan mendaftar, mengemas kini meminda maklumat permohonan sebelum tarikh tutup permohonan. Hanya pindaan yang terkini sahaja diambil kira untuk tujuan penyimpanan data.